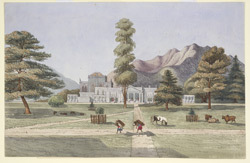 Watercolour of the British Residency at Kathmandu in Nepal, by Henry Ambrose Oldfield (1822-1871), c. 1850. This image is inscribed with notes about the garden on the reverse. At the end of the Anglo-Nepal War (1814-1816), by means of the Treaty of Segauli imposed on the Gurkhas who ruled the Kathmandu Valley, Nepal had to accept its present eastern and western boundaries and admit an official British Resident in Kathmandu. Dr Oldfield, who was Residency Surgeon at Kathmandu from 1850-1863, wrote in 'Sketches from Nipal, Historical and Descriptive...' (1880), "Outside the city, towards the north, are the suburbs of Timmale, which contains two or three large houses belonging to sardars, and formerly occupied by Generals Badrinat Singh and Jai Bahadur. Timmale extends towards the British Residency, from which it is separated by a parade-ground, attached to which is a building containing the headquarters of two Gorkha regiments...Adjoining this parade-ground, on its north side, is the British Residency, with the barracks, occupied by a company of sepoys. The British lines occupy an area of about forty acres, and are situated on the high grounds immediately overlooking the plain of the Bishnmatti river." This is a drawing of the British Residency described in his quote.